Five senior FBI officials—four of whom were part of the bureau’s cybersecurity operations—have either left since June or are set to retire this month. The FBI confirmed three of the departures but does not comment on personnel matters below the executive level. David Resch, the executive assistant director for the FBI’s Criminal, Cyber, Response, and Services Branch, is leaving after 28 years of service, according to the FBI. Bureau Director Christopher Wray appointed Resch to the post in April. Carl Ghattas, the executive assistant director of the FBI’s national security branch, is leaving for the private sector after 20 years of service, the FBI said. Ghattas was promoted to the post by then-Director James Comey in February 2017. 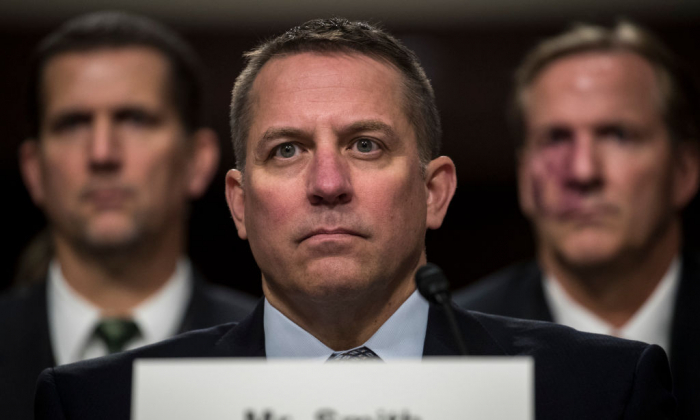 Resch’s subordinate at the cyber division, Assistant Director Scott Smith, is leaving for the private sector after 22 years at the bureau, the FBI said. Comey promoted Smith to the position in October 2016. The FBI does not comment on personnel matters below the executive level, but Jeffrey Tricoli, the chief of the bureau’s cyber section and co-leader of the Foreign Influence Task Force, left for a private-sector job in June, according to his LinkedIn profile. In addition, Deputy Assistant Director Howard Marshall, Resch’s subordinate at the cyber division, is also retiring, according to a brief speech praising his service by Rep. French Hill (R-Ark.) in a July 17 speech on Capitol Hill. Resch, Smith, and Marshall headed the FBI’s cyber division. Tricoli was the chief of the cyber section and co-led the Foreign Influence Task Force (FITF), which was assembled by Wray in the fall of last year to investigate election meddling by foreign entities, similar to Russia’s alleged interference in 2016. Wray and Tricoli spoke about FITF at a cybersecurity conference at Fordham University in January. Part of the unit’s work involves identifying foreign influence attempts and notifying the public and media companies. Much about the task force remains secret, including the personnel involved. According to an FBI spokesperson, FITF is a collaboration between the bureau’s counterintelligence, cyber, criminal, and counterterrorism divisions. Special counsel Robert Mueller indicted 12 Russian intelligence officers on July 13 for allegedly hacking Democratic computer systems, stealing emails and files, and posting the contents online with the aim of interfering in the 2016 election. The contents of the indictment match the evidence included in a report issued by the House Intelligence Committee in April last year, according to committee chairman Devin Nunes (R-Calif.) The indictment left out evidence that Russians also attempted to hack Republican systems. The retirements by the senior officials also come as Congress continues to investigate the actions bureau personnel took in 2016 and 2017 before and after the presidential election. Text messages between FBI Deputy Assistant Director Peter Strzok and FBI lawyer Lisa Page sent during that time cast a cloud over the investigations into Hillary Clinton’s use of a private email server and the campaign of President Donald Trump. Strzok was the lead agent on both probes while expressing intense bias against Trump and in favor of Clinton. Strzok suggested that Clinton would win “100,000,000 [to] 0,” wrote that he would “stop” Trump from becoming president, discussed an “insurance policy” in case Trump won, and mused about “impeachment” after the election. Contrary to the conclusion of Ghattas’s team, the inspector general found that text messages between Strzok, Page, and three other FBI officials, “cast a cloud over” and “sowed doubt” about the FBI’s work in the Clinton investigation. “We found that the conduct of these five FBI employees brought discredit to themselves, sowed doubt about the FBI’s handling of the Midyear investigation, and impacted the reputation of the FBI,” the inspector general stated in the report. Ghattas was one of the five officials named by Rep. Louie Gohmert Jr. (R-Texas) during a hearing with Wray in December last year. Gohmert asked Wray if Ghattas expressed bias against the Trump administration. “My experience with Executive Assistant Director Ghattas has been very positive and he’s been a complete professional in all my interactions with him,” Wray said. According to a person familiar with FBI personnel matters, the recent rise in special agent retirements is due to a hiring boom the FBI had in the late 1990s. FBI agents are eligible to retire after 20 years in service if they turn 50. The mandatory retirement age for agents is 57. Many of the agents who entered the bureau during the boom in the 90s are now eligible to retire. The FBI expects the higher level of agent retirements to continue for a few years. The attrition rate for agents hired during the last three fiscal years is less than 0.6 percent, the person said. “It’s essentially a complete house cleaning,” Ruskin said, noting that Smith, Marshall, Resch, Ghattas, and Tricoli all rose through the ranks during the tenures of Mueller and Comey. “Whether they’re connected or not there’s no way to know for sure. But it can be a reasonable interpretation that Wray is trying to completely clean out the bureau in order to promote new blood and get people who would be more amenable to his direction,” Ruskin said.